Name Tags | Xylem Inc.
Name tags not only provide a means for identifying ourselves, but also provide an opportunity to subtly convey our brand identity to our audiences. 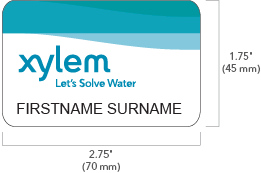 The Xylem branded name tag can be used when interfacing with others at tradeshows, meetings or other events. The recommended size measures approximately 2.75 inches (70 mm) wide by 1.75 inches (45 mm) high and features the Xylem logo and wave graphic on white. Names should be imprinted in black using 15 pt. Arial Regular, all-caps.